For its 50th anniversary in 2002, TV Guide has been featuring best of lists all year long. Maddie and David were one of only about ten TV couples in a Most Romantic Couple poll wherein they performed very well. But when the 50 sexiest stars of all time list was posted and Cybill & Bruce weren't on it, fans were outraged. Here is one such letter that attempted to set this record straight. 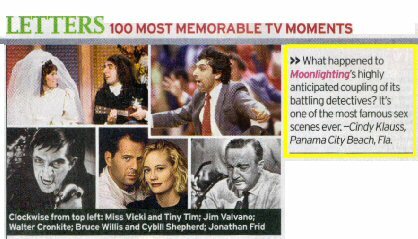 In the TV Guide put together another list of their 100 most memorable moments on TV, and this time, they overlooked Moonlighting. This letter to the editor pointed out the error of their list.